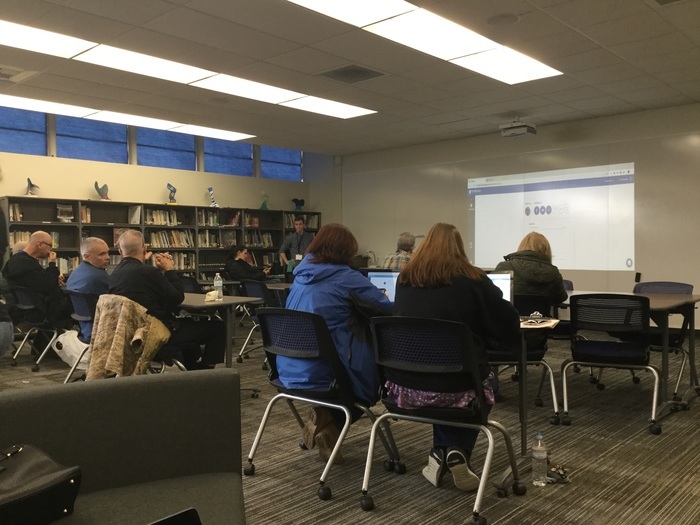 Trona teachers are training to use thrillshare! Trona teachers are training on thrillshare. Parent / teacher conference letters will be sent home March 11.
Who has some ideas that will help make our campus look more appealing? Ms. Kimber is starting a campus “Beautification Club” that will be doing projects around campus like painting rocks, murals, gardening etc. The club will be meeting in A4 on Tuesdays and Thursdays during lunch. There will be a sign-up sheet in the office for those who are interested. 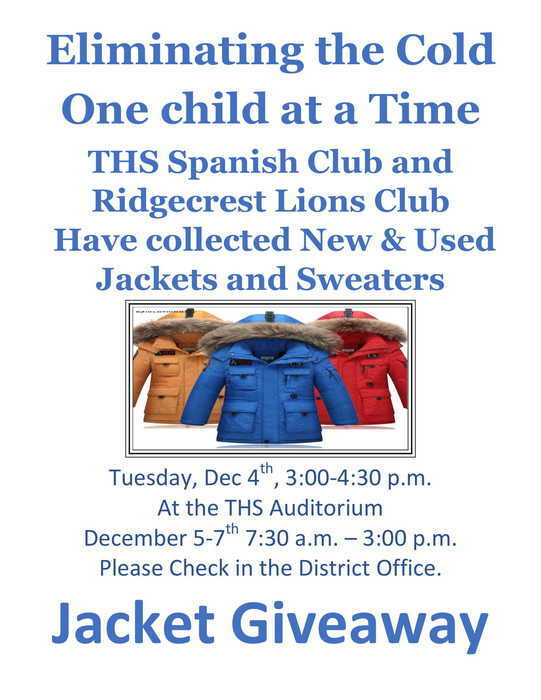 The first meeting will be next Tuesday. Dental screening papers will be sent out on Tuesday, January 8th and the screenings are the following day. All students K-6 will be screened unless you return or email the following form https://5il.co/610e to Angie Ball at aball@tjusd.net. Please include students name and parents name and contact information. Bus time changes for TK and Preschool students ONLY Beginning Tuesday, Jan. 8, 2019 the kindergarten students will be staying all day. TK students will remain on the same 11:15 dismissal time. 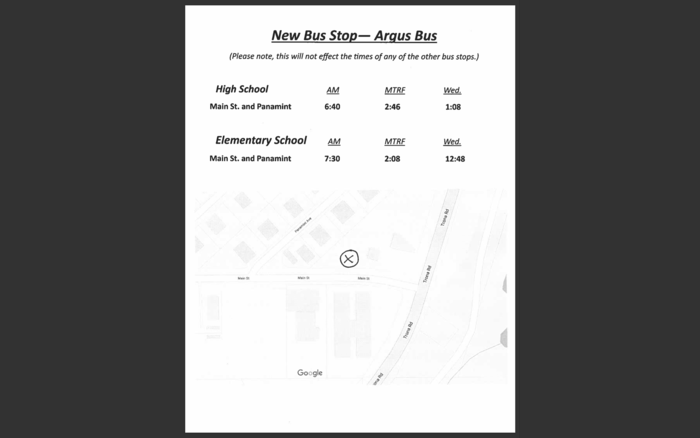 Due to this change, the bus drop off times will be earlier than normal. Thank you for your patient with this change. The first couple weeks will be an adjustment. Spark of Love signup sheet is the HSO, if you know anyone who would want to participate please come get a signup sheet. The Elk's Canned Food Drive winners are…..Mr. McGirr’s 4th graders! Have a great break everyone! We will see you again Monday, November 26th!! 6th Grade Boys Basketball there will be practice on Monday @ 6:30-7:30 p.m. even though it is a holiday. You need to have your sports physical completed BEFORE you can practice. Have fun on your trip to Death Valley 4th and 5th graders!! November is the month of giving thanks. We should all be grateful for what we have. Let’s add to it and let the people around us know how grateful we are of them by sending them a Grateful Gram. We will be selling Grateful grams for .50 each in room B3 during morning and lunch recess from now until Nov. 30 th . There will be an Awards Assembly today at 9:30! Report Card will be mailed home tomorrow. 6th grade field trip to the Maturango Museum is tomorrow. Students may wear a costume tomorrow, but NO face paint, weapons, masks, etc. 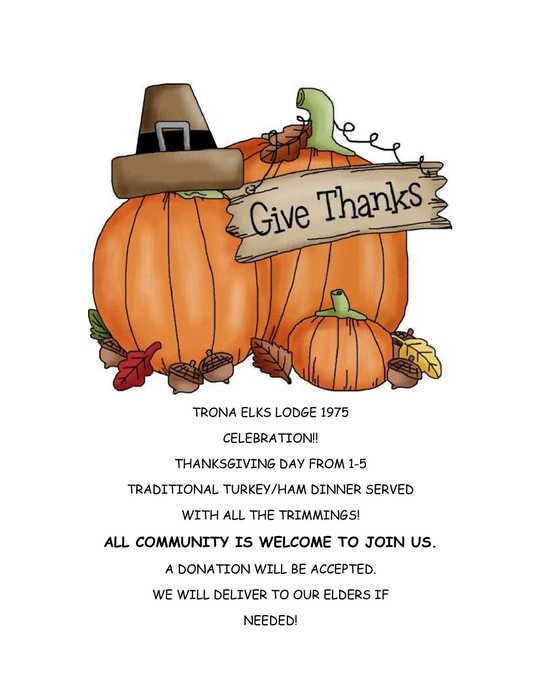 TRONA ELKS LODGE 1975 CELEBRATION!! THANKSGIVING DAY FROM 1-5 TRADITIONAL TURKEY/HAM DINNER SERVED WITH ALL THE TRIMMINGS! ALL COMMUNITY IS WELCOME TO JOIN US. A DONATION WILL BE ACCEPTED. WE WILL DELIVER TO OUR ELDERS IF NEEDED! Have fun today going to the California Science Center 5th & 6th graders! 6th grade boys interested in playing basketball can sign up in the Elementary Office. Tomorrow is Blue & White Day. Wear Blue & White to show your Trona Pride! The Elks is sponsoring an essay contest, “What Makes You Proud of America.” Contest is open to students in grades 5 & 6. Essay maximum is 300 words and due Friday, Dec. 7. Grading period ends tomorrow. Report cards will be mailed out Friday, Nov. 2. Student Council is selling Boo Grams in room B3 during 9:00 recess and lunch recess. The cost is .50 per gram. Students may send them to other students and staff at both the elementary and high school. Parents are welcome to come to the office and send them to students. Sales will continue from now to Oct. 31 st . Welcome to our new site! We are constantly updating and adding new information so check back frequently.